Squaw Valley skier Travis Ganong, shown in a training run at Beaver Creek, Colo., last season, finished fifth in the Birds of Prey Downhill on Friday. KVITJELL, Norway — Talk about a breakout season. Just a couple of weeks after competing in his first-ever Olympic Games, Squaw Valley skier Travis Ganong knifed through rugged snow and limited visibility last Friday to earn the first World Cup podium finish of his career with third in the first of two downhills in Kvitfjell, Norway. The next day, Ganong finished fourth, a mere .05 from a second downhill podium. Fresh off what was a career-best fifth place at the Olympic Winter Games downhill in Sochi, Russia, Ganong wiped his goggles mid run as rain and wet snow pelted the fog-shortned course Friday. Olympic super G champion Kjetil Jansrud of Norway and Austrian Georg Streitberger tied for a unique victory. Bode Miller finished 16th, Steven Nyman 18th and Marco Sullivan of Squaw Valley 21st to give the Americans four finishers in the top 30. Ganong had his sights on the top of the podium the following day but finished just out of the top three. The course was held from the super G start after consecutive days of fog, rain and wet snow prevented the crews from preparing the full-length 1994 Olympic speed track. Canadian Erik Guay hit 88 mph on the final speed trap to secure the win, the fifth of his career, with a time of 1:22.17. 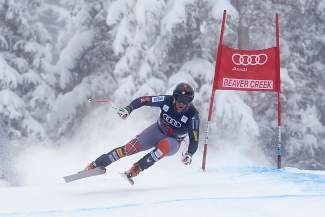 Miller also landed in the top 10 with eighth in the final men’s downhill prior to the March 10-16 World Cup Finals in Lenzerheide, Switzerland. Sullivan finished 24th and Nyman 25th. Only the top 25 athletes in each discipline qualify to start that discipline at World Cup Finals. 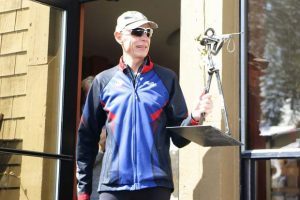 Athletes with 500 World Cup points can also start in any race and the Junior World Champion can start the discipline he won. Only Miller, in seventh, and Ganong, in ninth, have qualified in downhill for the U.S. Ski Team. Sullivan and Nyman are just outside the top 25. Norwegian Aksel Lund Svindal tied for sixth in the race but mathematically secured the season-long downhill title with a 525-360 lead over injured racer Hannes Reichelt of Austria and Guay, who now has 357 points. Svindal also jumped into the World Cup overall lead with a 982-955 margin over two-time defending champion Marcel Hirscher of Austria. Hirscher is seeking to become the first three-peat overall champion since American Phil Mahre did it from 1981-83. 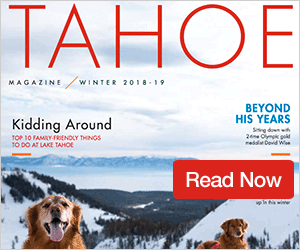 Ganong credited his upbringing at Squaw Valley for his success this season.